What do you see, exactly, when you take a helicopter tour of New York? Click here to see photos from a helicopter tour. What routes do the helicopters take and how do you know which tour is best for you? A short flight or a longer one? I often get asked these questions, so I created this page. Below you can find descriptions of some different flights on offer, three of the routes are also shown on the map. There are no more flights on Sundays that depart from Manhattan. This means, though, that the other days do sell out faster, so reserve your spot before you travel to New York. The route with the red line is the Manhattan Sky. This helicopter tour takes approximately 12-15 minutes and is the shortest of all three tours. The price is about £163 which also makes it the cheapest helicopter tour. The route with the yellow line is called the Scenic tour. It takes the same route as the Sky Tour, marked with the red line, but this helicopter tour continues on, further towards Harlem. You may even see Yankee Stadium. This tour takes approximately 18 minutes and costs about £225. The route with the blue line is called the Grand Island Tour. This is the longest tour available, and consequently, it also costs the most. You fly past Staten Island and even see as far as the Bronx. Including, of course, the same sites as the tours marked with the red and yellow lines (listed above), but you will see much more with this route. The price is approximately £272. 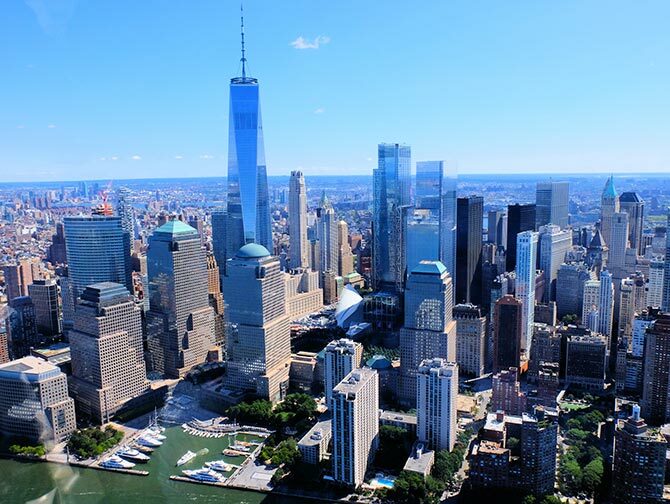 The majority of the helicopter tours depart from Manhattan. Where, due to strict city regulations they are not permitted to fly on a Sunday. Do you still want to take your helicopter flight on a Sunday? Then there is a good value flight, which departs from New Jersey and even includes the option to take a transfer to the heliport! EXCLUSIVE PACKAGE! If you really want to do something spectacular, book an evening flight with cruise! First you’ll take a helicopter flight for 12 to 15 minutes (see the red route below). The flight departs at around 17:30, which means, between October and March you’ll experience a real evening flight but between the months of April and September, it will be in daylight/sunset. Afterwards, you take a short walk to Pier 16, where you will board the cruise. Setting sail from Manhattan, the boat takes you past the Brooklyn Bridge, Ellis Island and One World Trade Center. In addition, you can enjoy a glass of (complimentary) champagne while taking in the Statue of Liberty! This is the ONLY evening flight which offers a departure in Manhattan! You’ll be amazed by the beautiful lights when taking the tour in the winter months. An absolute must, especially for people who have already done a helicopter tour and now want to experience something unique. The price is around £217. If you want to fly later in the evening, or if the above flight is sold out, you can book this alternative evening flight. It departs from New Jersey and you can get there by train from Penn Station. This flight doesn’t include a cruise. Just as spectacular, is the no door helicopter flight. Perfect for adrenaline junkies, budding photographers and anyone else who wants to do something extra special in New York. 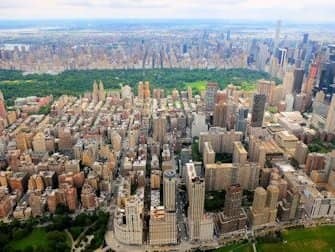 Without the restrictions of the doors, you have the clearest views of Manhattan and all its famous sites. The flight departs from an airport in New Jersey, close to Manhattan. After take off, you fly for 15 minutes over Downtown Manhattan. You will have plenty of time to enjoy the views and take some beautiful photos. Do you want a private VIP helicopter flight, is money no issue? Then this is your chance! With this 30-minute tour you’ll see the most popular sights of New York, alone or with your friends/loved-one. The helicopter seats a maximum of five people, so if there are only two of you, the free seats will be empty and you’ll have the whole helicopter to yourselves. This is a great thing to do if you have an important question to ask or day to celebrate. This flight leaves from New Jersey, you can travel there by train from Penn Station. Important! After booking your flight, make sure you contact the tour operator to confirm the exact date and time of your booking. After making your booking online, you’ll receive a voucher by email, containing all the tour operator’s contact information. I advise that you contact them at least two weeks in advance, if not before. If you are booking within the two weeks prior to your flight, get in touch with the operator right away to confirm the time and date. The earlier you confirm your booking, the more choice you have of the available time slots for your date. If your plans change upon arriving in New York and you want to rebook your helicopter flight, you can do so by contacting the tour operator.